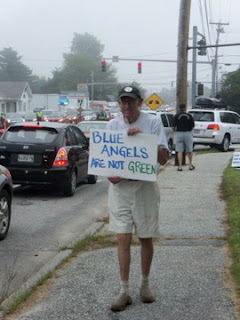 August 27, 2011 in Brunswick, Maine. Today there will be protests outside the gate of the airfield in Brunswick, Maine -- formerly a naval air station -- where drone technology and other new weapons to intimidate civilian populations are developed. On September 5 from 10am to 1pm, members of local peace groups will bring messages pointing out some truths about warplanes showing off for "entertainment" that should be obvious. When the US Navy is willing to promote Blue Angels "aviation fun" by offering reduced admission to pregnant women, the elderly, and people with heart conditions as a way to study the effects of exhaust, noise, napalm, and other stresses caused by these war machines in order to help taxpayers make more informed decisions on how their wealth is invested, I may change my opinion on the Great State of Maine Airshow. Until then, I remain opposed to this spectacle and am rethinking my habit of listening to Frank FM, a great classic rock station, and Sam Adams, a great beer. I'm certain that our great state boasts radio stations and breweries that don't glorify the destruction of the planet so directly. How do you produce the smoke, and why do you use it? The smoke is produced by pumping biodegradable, paraffin-based oil directly into the exhaust nozzles of the aircraft, where the oil is instantly vaporized into smoke. The smoke provides a traceable path for spectators to follow, so they can see the flight profile that has been flown. It also enhances safety of flight by providing a valuable means by which the solo pilots can see each other during opposing maneuvers and conditions of lowered visibility or haze. The smoke poses no hazard to the environment. The schedule for Blue Angels shows year round is a show a week, on average, plus one or two practice sessions a week in Penascola, Florida. The jets fly all over the country constantly. Then there are the completely separate Air Force Thunderbirds air shows, which follow a similar schedule of constant polluting. Who will hold the U.S. military accountable for their destruction of our environment? Certainly not Congress, the White House, the Republican or the Democratic Party. 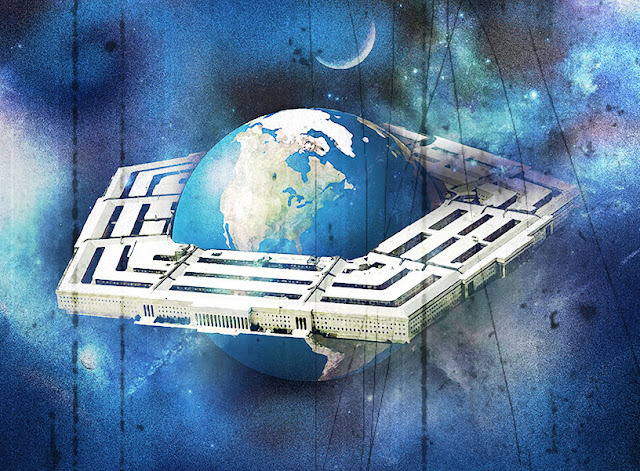 That leaves we, the people -- at least those of us who are not fooled by elaborate, expensive Pentagon smoke and mirrors. We should stop calling it the Pentagon and start calling it the pentagram.